Editor's note: Recently, Stansberry Research founder Porter Stansberry wrote a powerful series of essays on the three most important concepts every investor needs to know. To make sure as many people as possible hear what Porter has to say, we're republishing his essays in a four-part series. We recommend reading them several times. They're extremely valuable. Imagine you had to walk across the Rub' al Khali – "the Empty Quarter" – of the Arabian Peninsula. This 250,000-square-mile desert is the largest sand desert in the world. Sand dunes there reach as high as 800 feet. It rains less than two inches a year. The surface temperatures reach 125 degrees. This isn't hypothetical. Three guys decided to try and walk across this desert completely unassisted. In 2013, South Africans Dave Joyce, Marco Broccardo, and Alex Harris became the first humans to walk completely unassisted through the Empty Quarter. They plotted a 1,000-kilometer course from Salalah, Oman to Dubai. You can listen to them talk about their adventure here. Their story is completely nuts... but fascinating. Think about the three most important pieces of equipment you'd need to walk across the Rub' al Khali, beyond the most basic stuff like shoes, clothes, food, water, etc. The most obvious piece of advanced equipment you'd need? A GPS, right? Nope. What Joyce, Broccardo, and Harris needed most wasn't a GPS... or even a map. What they had to have to make it across 1,000 kilometers of desert in 40 days (after which they would have quickly starved to death) was Google Earth. They needed to know their precise position in the desert relative to the giant sand dunes, which you can only see using Google Earth's satellite photos. Before the advent of publicly available satellite photos, walking across this desert would have been impossible. GPS alone wouldn't have been enough. They also needed a strong, lightweight, easy-to-pull cart, so they could carry enough water for the journey. Obviously, they needed food, too. But the water was far more critical and heavy to carry. They spent about three years testing various designs for carrying enough water. The key to success was using mountain bike tires on their cart, rather than wide full tires, which were too difficult to pull through the sand. And finally... to make sure they had continuous access to Google Earth, they needed to use a solar-based charger to power up a satellite phone. They lost the charger on the 10th day of the trip. So one of them had to turn around and follow their tracks for 25 kilometers to find the charger before it got dark. Without it, they probably would have died. Imagine trying to find that charger... before dark... in the desert... by yourself... knowing that if you couldn't find it, you and your friends would probably die. Learning the story about the guys crossing the desert, I started thinking about the three most important things most investors need to understand if they're going to be successful in the stock market. Not the obvious stuff... like the way dividends compound returns or the time-value-money formula (which explains that your returns will be driven by how much time your investments are allowed to compound and how much money you save). Nor am I talking about the more advanced, but still simple concepts, like position sizing, trailing stop losses, and avoiding taxes (where possible). Porter, what are the three things you believe every investor in common stocks must know to succeed, but that you believe most people don't know how to do? Where is the greatest gap between the value of knowledge and the inexperience of most individual investors? No. 1: The most important thing for investors to understand about investing in stocks is simply what kind of businesses make for great investments and how to properly value these kinds of businesses. You can think of this knowledge as your personal Google Earth for crossing "the desert" of investing. Knowing how to recognize great businesses and knowing what they're worth is like knowing where the sand dunes are and how to get past them. Here's an example of what I mean: Do you think Markel (MKL) – trading around $770 a share – is an expensive stock? Why or why not? If you can answer this question within 30 seconds by looking at a few key statistics, then you're ready to cross the desert. If you can't... you're just not ready. You have to power up your satellite phone and spend more time studying your maps. If you have no idea whether Markel is expensive or cheap, don't worry. You're not alone. Judging by my experiences with wealthy and business-savvy subscribers, I would estimate less than 10% of our subscribers really understand these concepts. Without this knowledge, I'm nearly certain you can't be successful as an investor. Not for long, at least. No. 2: The second thing I know you must have to "cross the desert" successfully is a strategy that will continue to make you money even when you're wrong about the big picture. I've been expecting a serious crash in stocks since 2013. So in my Investment Advisory, we trimmed our long positions by selling some stocks. And we hedged our exposure to the market by selling short some stocks. But we didn't sell everything. And we didn't move to a 100% short portfolio. We've done great with our investments since 2013, even though my market outlook has been 100% dead wrong (so far). The idea that you don't ever want to bet the farm on any particular outlook (or any particular investment recommendation) is hard for most investors to understand and implement. When events in the world spook most individual investors, they simply pull out of stocks completely. They generally do so at the worst possible time. You have to learn how to make money even when you're wrong about the market as a whole. And you have to follow your strategy... even when it's scary. No. 3: The last thing I think most individual investors either never learn or only learn the hard way after several big beatings is to never, ever chase what's "hot." These investment "mirages" will cost you almost every time. It takes a lot of discipline to stick with great businesses that you can personally understand. It takes discipline to buy them when you can get them at a reasonable price. It takes discipline to follow your position-size limits. When a great new business comes along – like online auctioneer eBay (EBAY) in the early 2000s – learn to be patient. Follow it for years, and buy it when it comes into your range. If you had bought eBay back in 2004, you'd be up a little more than $3 per share today (from $58 to $61) more than a decade later. Sure, eBay was and is a great business with a huge "moat." Nevertheless, investors who chased after it while it was "hot" saw their investments decline almost 90%. It was far better to have bought it for less than $15 a share back when it was trading for a reasonable price. Over the next three days, I'll be going over these three concepts in detail. I hope you'll take the time to read these essays and think about them. (Remember, there's no such thing as teaching, only learning.) Knowing these ideas is the best advantage I can give you as an investor. You don't have to be a genius to be a great investor. But you need the proper map. And you need the discipline to follow it. "Today, I'm going to show you one of the most advanced investment skills you could ever master. Think of today's essay as a test..."
"There are very few sectors that offer truly extraordinary rates of return and that don't require taking any material risk..."
In short, low interest rates and the Fed's loose-money policies are allowing the wealthy to borrow money and buy stocks, real estate, and other hard assets. But rising prices squeeze the lower-income wage earners, who have to pay more for everything while their wages stagnate or fall. 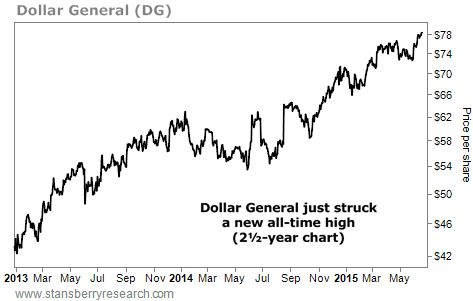 While this trend is terrible for everyday Americans, it has been a boon to discount retailers like Dollar General (DG). Dollar General is one of America's largest "discount retailers." It doesn't sell "prime" brands... It sells everyday goods at low prices. And odds are good that the average American lives closer to one of Dollar General's 12,000 locations than to one of Wal-Mart's 5,000 U.S. stores. As you can see in the chart below, the stock hasn't just held steady. Last week, it struck a new all-time high. And shares are up 80% over the last two and a half years. This trend doesn't show any signs of slowing down and DG has been one of the prime beneficiaries. "Like many other professional investors, we believe insurance is the best business in the world," Porter writes in his Investment Advisory newsletter.